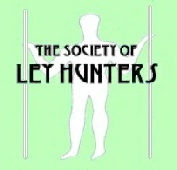 This ley runs for 13 miles NNE-SSW through Avebury and Silbury Hill. Bincknoll Castle (10787929), a motte and bailey, provides the most northerly marker for this alignment. It is set on a chalk promontory and has dramatic earthworks to match the views. Access is via a signposted public path over a mile long. Further S, the ley passes through a well (10567644) in a triangular enclosure at a crossroads in Broad Hinton. The ancient well at one time provided the only source of water in the village, but when a cat fell down it and was never recovered it was capped over. A few hundred yards further on, and the ley goes through the churchyard of St. Peter's Church (10557631). The course of the line enters the churchyard alongside the lych-gate and misses the tower of the 13th century church by 4 or 5 yards. The next ley marker is the magnificent henge of Avebury (described in SW10). The ley goes through the W edge of the henge and across the WSW entrance, and proceeds to nearby Silbury Hill (10006855) where it passes over the W flank of the gigantic mound. The 'hill' is the largest man-made mound in Europe, being 130 feet high and covering 5 acres at its base. A broad, deep ditch surrounding it has become filled with silt. Recent research confirms a Neolithic origin for Silbury. Various excavations over the centuries (the most thoroughgoing being in 1968-70) have failed to reveal a burial. The purpose of the mound, like much of prehistoric activity, is unknown. A number of legends are attached to Silbury, including one stating that it is the burial place of a king. Zel or Sil, on horseback or in a golden coffin. According to Avebury researcher Michael Dames Silbury is, in effect, an earth-sculpture of the pregnant Great Goddess, a fertility symbol par excellence. He has also traced the form of a 'composite goddess' in the landscape around Avebury, with prehistoric monuments emphasising the natural features comprising the figure. One of these is the next marker of this ley - the former stone circle at 09866713). Within sight of Silbury. Nothing is now to be seen of this feature which, according to Dames, marked the navel of the landscape goddess. Stukeley described the structure as 'a very large oblong work' and A.C. Smith in 1877 saw a basically oval feature with a bank protruding to the N.
Going on down the ley, the line crosses Wansdyke - a post Roman dyke - at Tan Hill exactly where another ditch earthwork, aligned on the ley, joins it (09676469). 'Tan' has obvious allusions to a beacon, and a part of the hill was the traditional site of a fair. Spectral corteges have been witnessed along Wansdyke, and in one instance three witnesses saw a phantom wagon bearing a coffin and being pulled by black horses at about the point the ley crossed the feature. On top the coffin was a crown or circle of gold. The whole scene vanished when it drew level with the onlookers. The final ley marker is Marden Henge (09175820). Enclosing 35 acres, it is the largest henge yet discovered. Its bank and the ditch did not complete a full circuit. Excavations have revealed grooved ware, suggesting a Neolithic origin. The ley enters the henge where the road cuts its N bank and would almost certainly have passes through the no longer extant Hatfield Barrow that once stood within the henge. This was said to be well over 400 feet in diameter and according to tradition, concealed a treasure. Pots of gold, it seems, are found at the ends of leys as well as rainbows!.